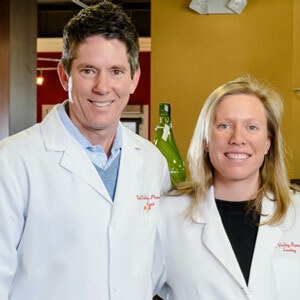 Vail Valley Pharmacy is owned and operated by Kent and Courtney Lambrecht and has been in operation since 2012. We pride ourselves on being professional, cutting edge, knowledgeable, efficient, and friendly. But perhaps most of all, we pride ourselves on being part of the community. It is rare person that we don’t recognize after the first or second (hopefully!) visit. Vail Valley Pharmacy works closely with some of the best supplemental brands on the market. As a convenience to you, in addition to coming into our store to pick up your favorite supplements, you will now be able to order any and all of your supplements and learn about other supplements and options, right here on our website. Vail Valley Pharmacy brings to the valley a full-service pharmacy staffed with licensed pharmacists and technicians that can fulfill your every prescription need. We have a fully stocked pharmacy for all your regular prescriptions; in addition we take most insurance plans so the copay for you will be the same as any big box mega-store. We also have the facilities and training to compound any medication your doctor prescribes for your needs.